I have been doing some reading about hydration, wanting to make sure I am drinking enough. Basically the goal is to drink enough to weigh the same before and after riding. According to Dr. Robert Murray, "Weight loss of more than 1 - 2 pounds indicates dehydration and a need for drinking more during your next exercise session." On most days I have been loosing about 3 pounds during a 1 hour ride. I have tried to increase the amount I am drinking and have switch from using water to gatorade. Yesterday I actually ended at the same weight I started at but today I again lost 3 pounds. 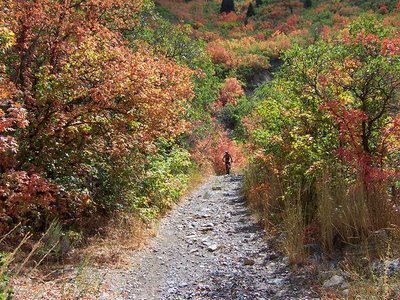 Slate Canyon is so beautiful with the fall colors. I guess it is time to take the family up AF canyon to get some good fall family pictures.